Nepenthes maxima X spectabilis is a cross between two highlanders. Many of Exotica's hybrids that use N. spectabilis are very showy. I've been growing it outdoors as it arrived from Exotica Plants and it is doing well. It's acclimated to my winter night time temperatures in the upper 30's and low 40's with little stress. The plant slowed down but didn't show any leaf or growth tip damage. For me, N. spectabilis can stress when temperatures go into the low 40's or upper 30's for periods of time. However, this hybrid seems very hardy. This particular seed grown plant seems to be a nice mix of both parents. The peristome striping is very N. spectabilis with a nice mix of N. maxima splotching on the pitcher. It's an easy going hybrid that requires little attention. 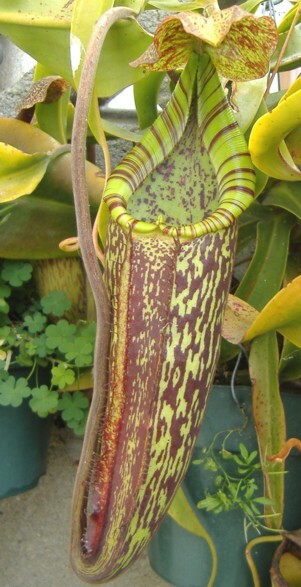 I'd consider this a nice hybrid to try to adapt outdoors or use a beginner's Nepenthes because of its proven hardiness to a range of conditions. Cultivation: easy grower outdoors, a good vigorous grower for a highland hybrid, possible indoor Nepenthes?